Diamond Vapor slot machine is a game from the exceptionally new Endorphina slots development company, and is actually very good, although the e-cigarette theme is a little different. The design of the mobile slot is pretty nice, the max jackpot of 10,000x per line is very strong and there is also a free spins feature offering up to 10 free spins. Check out all the details of this new game in the full Diamond Vapor slot review below. They say there are no longer any new ideas – and that’s certainly often the case in the predictable world of video slots – but we have to admit we’ve never seen a game quite like the Diamond Vapor slot before. A five-reel, 10-payline title from Endorphina, Diamond Vapor “draws” on the simple act of using an e-cigarette (vaping) for its inspiration and sets its reels above a backdrop of billowing plumes of blue-tinted smoke. The unique symbols to feature in the game include three vapers, an e-cigarette, coloured bottles of liquid resembling five fruity flavours and a diamond vapor substitute wild logo. Playable from as little as £1.00 per spin, the Diamond Vapor slot machine can be enjoyed across all desktop, mobile and tablet devices and includes a larger-than-average 10,000x jackpot. The game also boasts both free spins and a gamble feature, meaning there’s plenty of opportunity for players to boost their winnings. Dealing with the two features in order, the main bonus in Diamond Vapor is triggered whenever the Vape Bar scatter symbol appears three or more times in a single spin. Should this happen, players will be rewarded with 10 bonus games that further benefit from a lucrative symbol expansion feature. Indeed, whenever players complete a winning payline during the free spins, the featured symbols (or, in the case of multiple wins being trigger, the highest value ones) will expand to fill their respective reel, thereby creating extra winning combos. As an added incentive, free spins can also be re-triggered. Moving on the “risk” feature, at the end of the free spins feature or any winning base game spin, players will have the opportunity to gamble their winnings in a quirky game of chance. Here, they must pick from two Vapers – Mike or Jack – to double their prize up to five consecutive times, with the vaper who exhales the longest plume of smoke being declare the winner after each individual round. 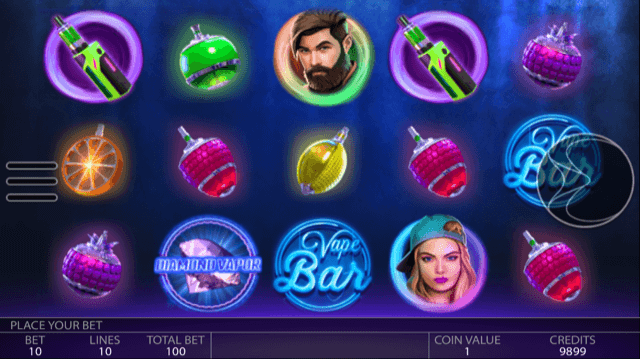 While it may not be the most obvious subject matter for a video slot, the Diamond Vapor slot actually works really well and provides great scope for interesting payline animations and quirky bonus features. Like the Diamond Vapor slot review? Check out these as well…..